By the mid-1960s, the big three U.S. Automakers knew that muscle cars weren’t just a passing fad but one of the biggest automotive growth markets. Though styling and image were paramount to selling these new muscle cars, it was the engines that gave these muscle cars character. The heart of all muscle cars from this time period was a V8 engine. And all V8 engines weren’t equal. Though there were many great high performance V8 engines during this time period, there are 5 that stand above all the others. Here’s the list of the 5 best high performance engines from the original muscle car time period. Before Buick got into the muscle car game in the mid-1960s it had an image similar to Buick’s current image. The current Buick lineup lacks real performance and has as much appeal to the performance car buyer as snow boarding in the mountains does to a year-round Miami resident. Buick engine engineers in the mid-1960s toiled like a bunch of Keebler Elves and by the 1970 model year, they had created one of the best high performance engines ever produced during the golden age. It was the Stage 1 455 cubic inch V8. Buick gave it a factory rating of 360 gross horsepower. Heck who were they kidding? True output was well over 400 horsepower. Not to mention the 1970 Stage 1 455 had one of the best low-end torque curves found in a vintage muscle car with a whopping 510 lb-ft of torque at a low 2,800 rpm. As tested by Motor Trend magazine (January 1970 issue) a 1970 Buick GS equipped with the Stage 1 455 ran the quarter mile in 13.38 seconds at 105.5 mph. This quarter mile time was so impressive that Motor Trend at the time called the 1970 Buick GS 455 Stage 1 the fastest muscle car it had ever tested. The 1970 Stage 1 455 had a 10.5:1 compression ratio, high performance heads, a Quadrajet 4-barrel carburetor, and a standard cold air induction system. For 1971-1974 the Stage 1 455 had a compression ratio drop to 8.5:1. The Stage 1 was still lethal, for 1971 it was was rated at 345 gross horsepower and 460 lb-ft of torque. For 1972-1974 horsepower was rated in the more stringent net rating standard at 270 net horsepower and 390 lb-ft of torque. The 1971-1974 Stage 1 was a full second slower in the quarter mile than the 1970 Stage 1. 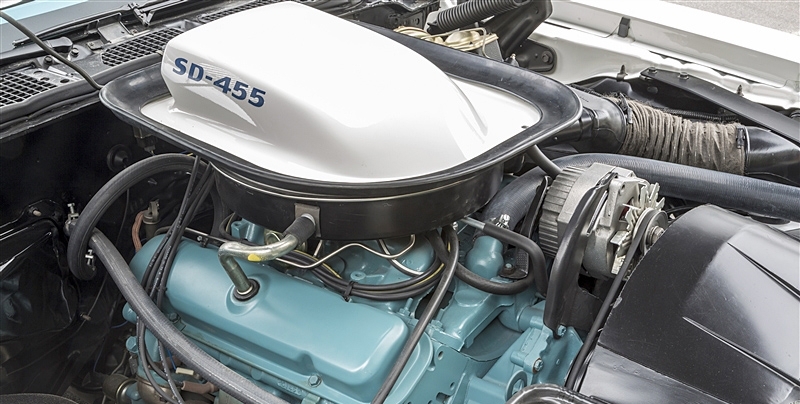 Though the low-compression Stage 1 455 was a formidable performance engine, the 1970 Stage 1 455 is the engine that will forever be the best of the best classic muscle car engines. Pontiac’s Super Duty 455 cubic inch V8 was never considered a big-block V8. This wasn’t because of its size, since Pontiac’s 455 V8 was around the same size dimensional as Ford’s FE big-block V8, it was because Pontiac never produced a small-block V8. All of Pontiac’s V8 engines with the exception of the 265 and 301 cubic inch V8s used the same V8 block size. Pontiac’s 265 and 301 V8s used a similar block size with a shorter deck so these were never consider small-block V8s. The Super Duty 455 or as it is sometimes called “SD 455”, was truly a miracle motor, it came to the party ultra late, right after the muscle car bubble burst. When many of the other automakers were cancelling high-performance motors due to a mandate that all U.S. market engines run on unleaded fuel starting with the 1972 model year which meant ridiculously low compression ratios, Pontiac acted as if the muscle car era had never ended. Pontiac released in 1973 the SD 455, arguably its best performance V8 engine. It was a low compression tire shredder that could stand with the very best high compression big-block V8s from the original muscle car time period. The SD 455 was only available as an engine option in the 1973-1974 Trans Am and Firebird Formula. Even though the SD 455 was rated in the much more stringent net horsepower ratings as opposed to the gross horsepower ratings used during 1971 and earlier model years, the SD 455’s factory rated output was seriously underrated at 290 net horsepower. Some 1973 Pontiac literature and press release information quoted a 310 net horsepower rating for the SD 455 which was still way under its true output. Hot Rod magazine tested a SD 455 equipped 1973 Trans Am and obtained a quarter mile time of 13.54 seconds at 104.3 mph. Even though the SD 455 had a ridiculously low 8.4:1 compression ratio, it made up for it with a free-flow intake manifold, free-flow round-port high-performance heads, TRW forged aluminum pistons, and a few other performance goodies. The end result was one of the most legendary muscle car V8s to ever be produced. Though a combined total of only 1,296 SD 455 equipped Trans Ams and Firebird Formulas were produced for 1973-1974, these cars will never be forgotten and will continue to be revered by many. Unlike many of the muscle car engines which were designed and engineered for street performance, the Ford FE big-block 427 cubic-inch V8 was originally intended for the racetrack. The 427 made its debut as an engine option in the full-size 1963 Ford and Mercury models. This original 427 V8 was known as the top oiler 427. However it was the introduction for the 1965 model year of the side oiler version of the 427 that has solidified this motor as one of the greatest performance engines of the muscle car era. Though there were a few different versions of this engine it was the R-code dual 4-barrel carburetor version available on a few 1965-1967 Ford and Mercury models that was the best performance engine Ford offered during the 1960s. As an example of its true potential a 1967 Ford Fairlane equipped with a side oiler R-code 427 V8 could run the quarter mile in 13.3 seconds. The R-code had a 425 gross horsepower rating at 6000 rpm which was slightly underrated. Torque was factory rated at 480 lb-ft at 3,700 rpm. The 1965-1967 R-code had a mid-riser intake, a high performance cam, high-performance heads, and a crazy 11.6:1 compression ratio. The 1965-1967 R-code 427 was a honest-to-goodness racing motor rammed into a street car. This is why the Cobra Jet 428 cubic inch V8 which was another high performance iteration of Ford’s FE big-block was more popular. Though not as powerful as the R-code 427, the Cobra Jet 428 and Super Cobra Jet 428 weren’t as high strung and were better suited for street use. Not to mention the 428 was less costly to produce. When the 1965-1967 Ford R-code 427 ended production, it was an end of an era. Never again would Ford offer a genuine race car motor under the hood of a production car. Even the street version of Ford’s mighty Boss 429 cubic-inch V8 was tame by comparison. When it comes to Chevrolet big-block V8 engines, it’s extremely tough to pick the top dog. Under most circumstances picking the L88 427 cubic inch V8 would usually fit the bill. However it was the 1970 LS6 454 cubic-inch V8 that was one of the best street muscle car motors ever produced. It had a factory rated output of 450 horsepower and 500 lb-ft of torque. Some experts claim true gross horsepower output was at least 500 horsepower. Never-the-less it’s advertised rating was the highest on paper factory horsepower rating of any muscle car engine during its day. There was no substitute for cubic-inches and in that respect the LS6 454 had the different iterations of Chevrolet’s 427 beat. Car Craft magazine (November 1969) tested a 1970 Chevelle SS LS6 and obtained a quarter mile time of 13.12 seconds at 107.01 mph. Had Chevrolet offered the LS6 454 in the 1970 Corvette, it would have been one of the fastest Corvette’s ever produced. Unfortunately Chevrolet only offered the 1970 LS6 454 in the 1970 Chevelle SS. Even though the LS6 had a very high 11.25:1 compression ratio, it was a reliable and ease to tune street motor. The LS6 also had a forged alloy-steel crank, solid valve lifters, TRW forged aluminum pistons, forged connecting rods, and an aluminum intake manifold. Unfortunately the LS6 would have a very short production life. It would return for 1971 as a Corvette only engine option and it was detuned to 425 gross horsepower due to a massive compression drop to 9.0:1 and a few other changes. Had the muscle car bubble not burst due to high insurance premiums and new government mandates the LS6 may have stayed around for a lot longer. If the English language had a better word for legend, that word would summarize Chrysler’s 426 cubic-inch Hemi V8. No engine had the respect of more muscle car fans than the 426 Hemi V8. A lot of the automakers who released muscle cars first had a stylish car that necessitated dropping a large displacement cubic-inch V8 into the engine bay. The Chrysler corporation was different it first released the 426 Hemi in 1966 as an engine option for mostly plain Jane Dodge and Plymouth models (the 1966 Dodge Charger was the exception). Chrysler had the ultimate engine with the 426 Hemi which was designed to win on the race track. It took Chrysler a few more model years for its Dodge and Plymouth divisions to release muscle cars that had styling to match the performance of the 426 Hemi. Chrysler offered the 426 Hemi for the 1966-1971 model years. Its reputation for ultimate performance was so solidified during this time period that the Dodge brand today is still profiting off the Hemi name which is applied to different iterations of FCA’s current pushrod Hemi V8. 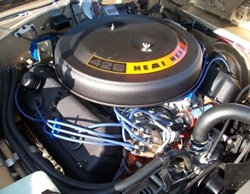 The racing version of the 426 Hemi had a 12.5:1 compression ratio, Chrysler dropped the compression ratio to 10.25:1 for all 426 Hemis sold in its production cars. This helped to give the 426 Hemi better reliability and smoother operation for day-to-day driving. However since this big-block was standard with massive high-performance heads, dual Carter AFB 4-barrel carburetors, a free-flow intake manifold, and many other performance goodies even the compression drop couldn’t take the racing out of this motor. The 426 Hemi had a factory output rating of 425 gross horsepower and 490 lb-ft of torque. For it’s last year, 1971, Chrysler also rated it in the more stringent net horsepower rating at 350 net horsepower. Back during the golden age of the muscle car the true test of an ultimate performance car was being able to break into the 13 second quarter mile time range, the 426 Hemi allowed many Dodge and Plymouth cars to achieve this goal. It didn’t matter which 426 Hemi powered car you had mid-13 second quarter mile times were on the average what you got. The sad aspect of this story is even with the 426 Hemi being available in many different 1966-1971 Dodge and Plymouth muscle cars it was a rare engine option due to its premium price. The average Joe who wanted high performance when buying a Dodge or Plymouth muscle car opted for either a 440 cubic-inch big-block V8 or 383 cubic-inch big-block V8, both of which provided great performance for a lot less cash.